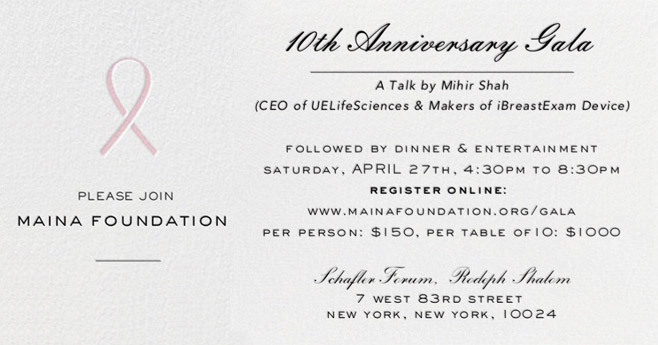 Maina Foundation is a non-profit organization dedicated to providing critical funding for increasing breast cancer awareness and promoting early detection to women in need of financial assistance. By working at a grass roots level, the foundation will devote majority of the funds raised to hospitals and clinics for furthering the cause of early detection. About 3500 cases are reported every year at the Tata Cancer Hospital of which 15 % are underprivileged whose life can be saved by providing critical funding for post operative care. Please donate generously for this cause .When we save a life we save the family as the woman is undoubtedly the fulcrum of the family. Become a part of our family. Together, we can save many lives. Apply Now! Copyright ©2015 Maina Foundation. All rights reserved.